London, 1st November 2016 – Masabi today announced that it has been selected to provide a mobile ticketing solution to Preston Bus, the company running bus services in and around the Lancashire city of Preston. Following a comprehensive review of Preston Bus’ existing ticketing offering, it was acknowledged that the fast fare system, requiring passengers to have the exact fare at the point of boarding, is a cause of frustration and inconvenience. The company wished to maintain fast boarding times, while meeting the increasing passenger demands for great customer service. A recent study has indicated that mobile ticketing, where a customer buys a bus ticket on their own mobile phone, reduces passenger boarding time by up to 9 seconds per passenger. This will benefit all passengers as journey times around the City should be reduced. Whilst Preston Bus will continue to accept cash from passengers as required, with the introduction of mobile ticketing the company hopes to be able to reduce bus dwell time by as much as 50% by 2020. Passengers wishing to make use of the service will be required to download the Preston Bus app to their Apple or Andriod smartphone. The customer will then able to choose from the full range of Preston Bus tickets; including daily, weekly and 28-day tickets which are paid for using a credit or debit card. The virtual ticket is then stored in the passenger’s phone and showed to the driver when boarding the bus. Masabi will be deploying its end-to-end mobile ticketing system, JustRide, which has been successfully deployed in cities around the world including; Athens, Boston, New Orleans and London and has recently successfully launched with New York’s MTA, the busiest commuter rail service in the United States. It comprises award-winning apps for ticket purchase, display and inspection together with back-end infrastructure for secure payments, ticket management, customer service, reporting and real-time analytics. As a part of the Preston Bus deployment JustRide will be using Mastercard Gateway Payment Services to enable simple, safe and secure in-app digital payments. Updates to the application will make purchasing tickets even easier by allowing passengers to pay for tickets using digital wallets such as Masterpass, the digital wallet from Mastercard. "Our goal has always been to streamline the travel experience, showing passengers the benefits of choosing Preston Bus. Using technology can remove the hassles that we know are associated with using cash to pay for tickets and the knock-on delays that can cause," said Bob Dunn, Managing Director of Preston Bus. “We are proud to be working with Masabi, who presented us with a simple, intuitive and easy to use solution. We are excited to be implementing technology that can improve everyday journeys for our customers." 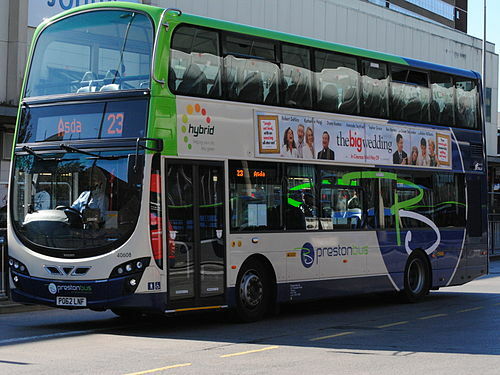 Preston Bus is the main operator of bus services in and around the city of Preston, Lancashire. The company, owned by AIM-listed transport group Rotala, has 260 employees and operates 120 buses, mainly on its high frequency city network.